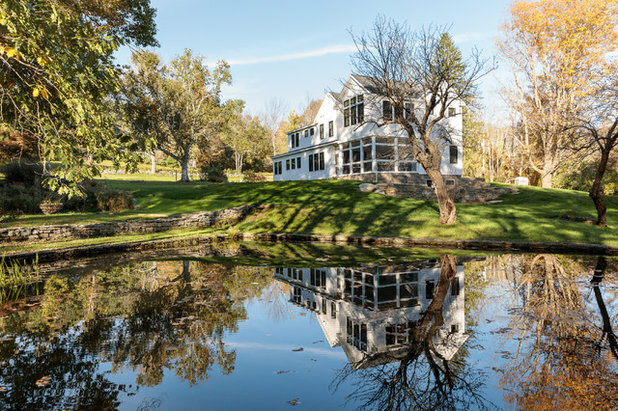 This New Jersey couple found an idyllic country property in western Massachusetts — a dairy farm with a historical farmhouse overlooking a pond, hills and trees. The original part of the house had been built in the 1700s, and a hodgepodge of additions over the years had resulted in small, dark spaces with a wonky flow. 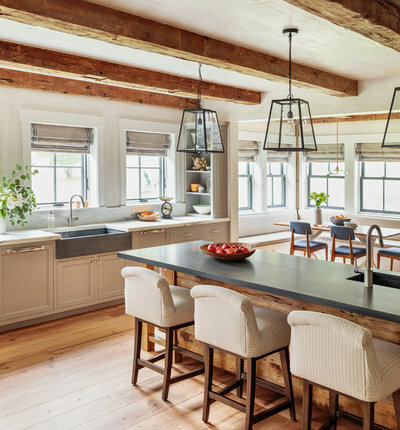 The couple hired interior designer Jess Cooney to work on a remodel that was to include full renovations of the kitchen and bathrooms, and cosmetic changes and furnishings throughout the home. 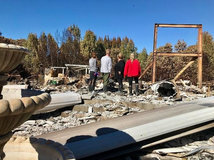 But before they could get started, they found out the hard way that the hodgepodge included bad wiring — they lost the house in a fire. The architects at Clark + Green transformed Cooney’s vision for the house into drawings. 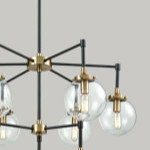 The style is a balance of old and new, rustic and soft, and open and cozy. The house was built on the same footprint but is taller than the original structure. This allows for a full basement and a higher perch that provides better views of the pond. “We wanted people to walk in and have no idea how old the house was,” Cooney says. 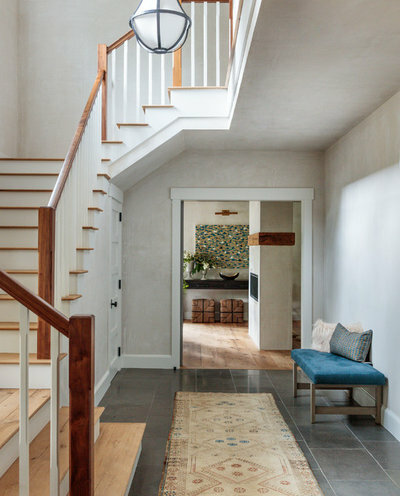 Using materials like limestone on the entry floor and plaster on the walls made the house look genuinely historical. One of the homeowners loves blues, blue-greens and celadon. 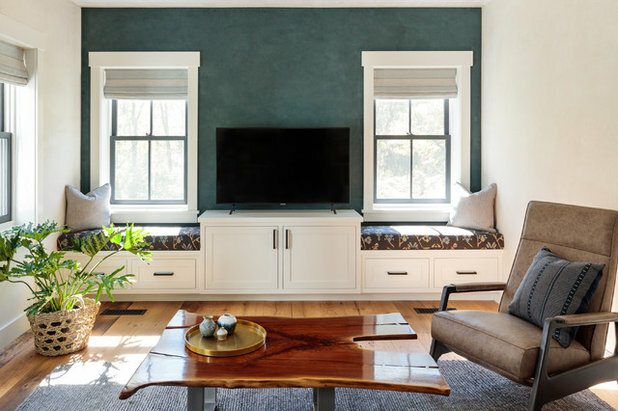 Cooney carefully incorporated blue touches, such as on this entryway bench, while maintaining a subdued country palette that puts the focus on the bucolic setting. She also worked on the couple’s main residence in New Jersey at the same time she worked on this house. “In that home, we really amped up the bright color and playfulness, but here, it’s quieter,” she says. 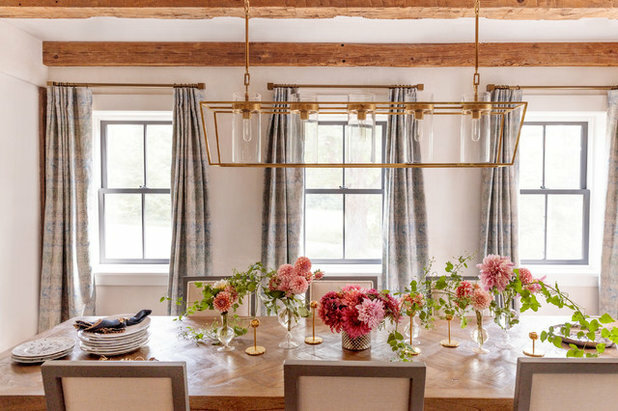 In the dining room and throughout most of the first floor, Cooney added an 18th-century sensibility by using antique reclaimed beams. 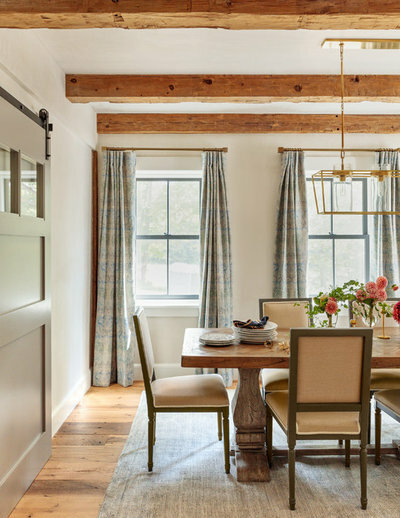 “We softened those kinds of rustic touches by installing window treatments in beautiful fabrics,” she says. 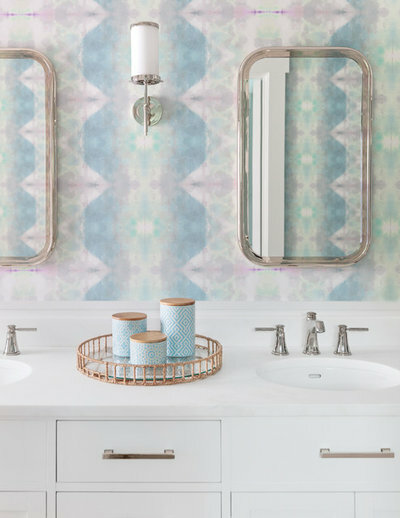 “Lots of people think you don’t need them out in the country because it’s so private, but they were needed for softness, and these clients understood that.” This fabric also brought in her client’s favorite shades of blue. The flooring is reclaimed oak. “I was adamant that they needed to invest in the floors to get the antique feeling that they wanted,” she says. The planks range from about 8 to 15 inches in width. “The layout of the planks was really important and tricky. 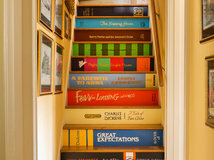 The contractor spent a long time puzzling them together to get it right throughout the house,” she says. 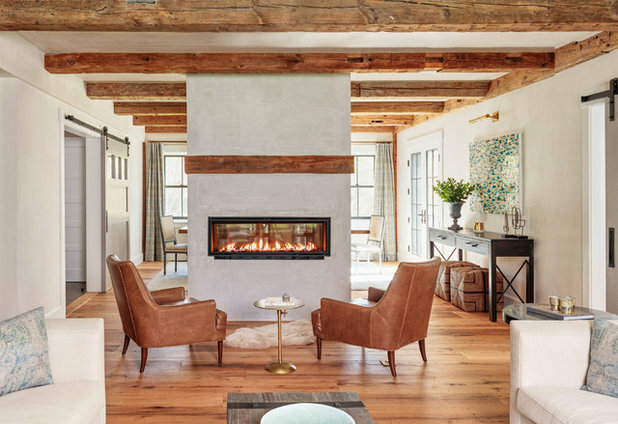 Although the new floor plan is more open than the original one, Cooney gave her clients a way to close off spaces by using large barn doors with transoms. “This was a good way to get a cozier feeling while still sharing the light between spaces,” she says. This door can close off the dining room from the entryway seen in the second photo of this story. A two-sided fireplace separates the dining room from this living room. The material palette of reclaimed wood floors, plaster walls and ceiling beams continues in this space. Another matching wood accent gives the eye a place to rest on the minimalist plaster chimney. The sliding barn door on the right leads to a cozy TV den. Just past that barn door, this nook serves as a home office and a place to store the family’s record collection. Pairs of custom sofas and armchairs create a comfortable seating area in the living room. 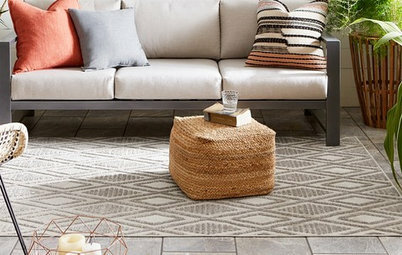 The Oushak-style wool rug cozies up the space. 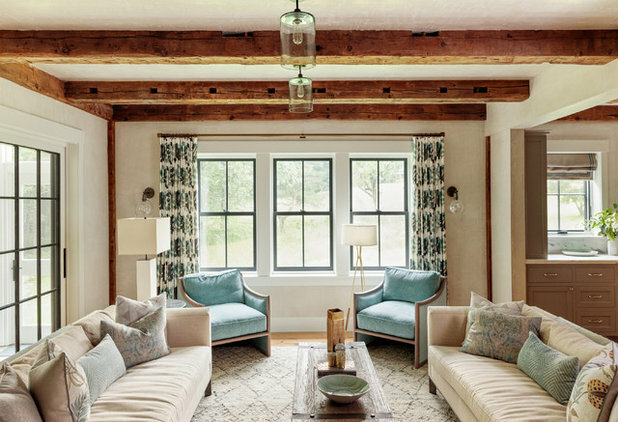 The rustic wood-and-iron coffee table ties in with the wood beams in this more formal space. 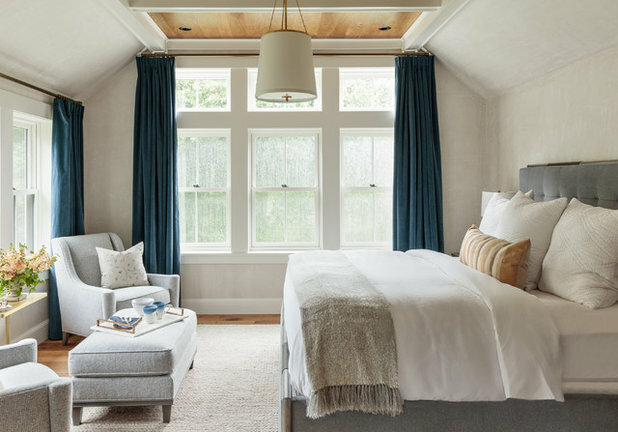 Dark paint on the windows draws the eye out to the pastoral views, while soft drapes frame it in pattern, add softness and bring in some of the homeowner’s favorite blue hues. 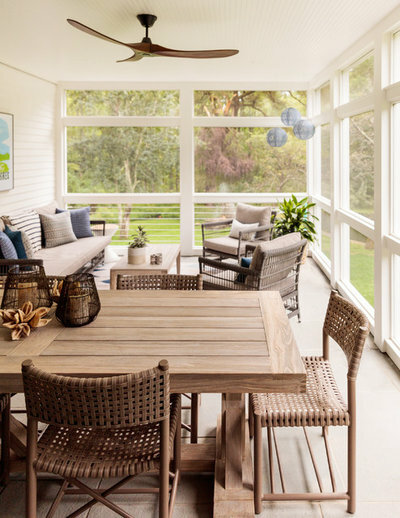 The sliding doors lead to a screened-in porch. Cooney placed the screened-in porch where it could take in the best views of the pond, and it’s a favorite spot for visiting and dining. Shiplap on the walls, beadboard on the ceiling and woven furniture add relaxed texture to the space. More beams and plaster continue in the kitchen. Cooney used only a few key upper cabinets to give the kitchen an antique look. 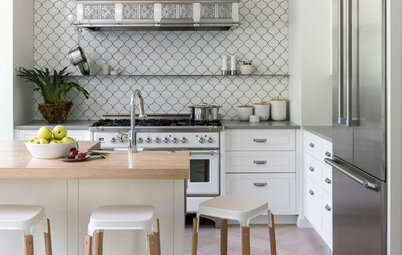 The perimeter countertops and the backsplash are Danby marble, from the neighboring state of Vermont. 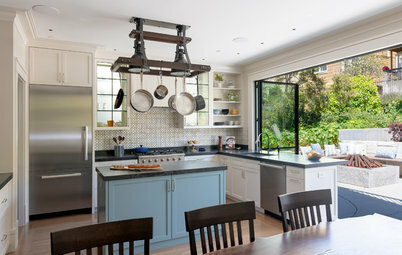 The island, its prep sink and the apron-front sink are Pietra Cardosa, a gray-blue stone that resembles soapstone but is harder and more durable. Another material Cooney used consistently throughout the house to get an aged look is iron, seen on the lanterns. 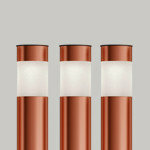 She used dark paint on the window trim to pick up on the lanterns’ dark finish. With all the straight lines, the room needed some soft touches. The upholstered counter stools, the edge of the range backsplash and the coarse linen Roman shades with fabric tape accents soften the space. Behind the range is a baker’s pantry and a workstation for the youngest daughter, an avid baker. It includes its own sink, countertop space and a stand mixer, as well as plenty of room to stash ingredients and other baking necessities. 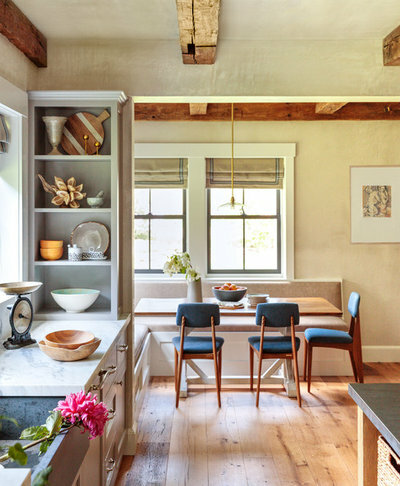 “I wanted to give the island a real worktable feel,” Cooney says. The reclaimed-wood base is outfitted with baskets for storage. The island’s prep sink is within easy reach of the range. The wood detail on the vent hood matches the beams. 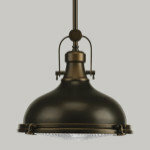 The antique scale that hangs from the ceiling adds some soft curves and age. 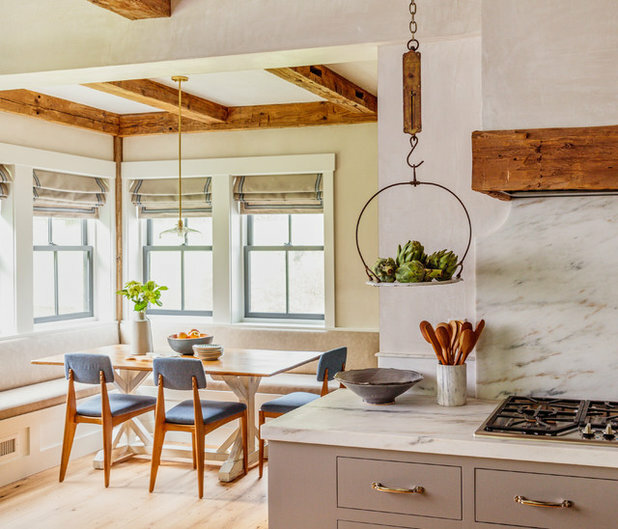 Traditional farmhouse two-over-two windows wrap the breakfast nook corner. The built-in banquette is upholstered in vinyl that looks like leather, making it easy to wipe up spills. 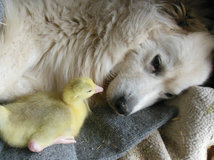 “Their dog also loves to jump up on the banquette, and this vinyl can handle it,” Cooney says. Blue appears on the chairs and the Roman shades. 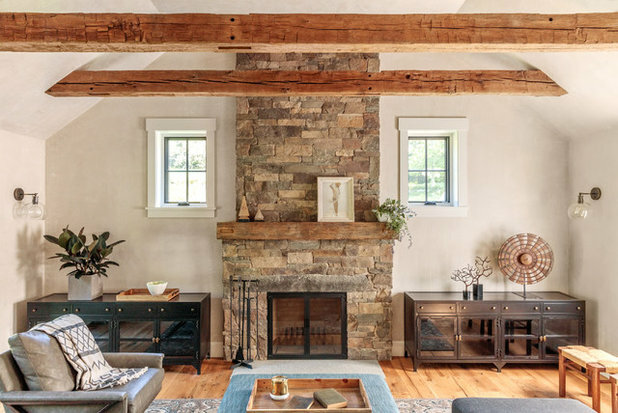 In the TV den, Cooney re-created one of the homeowners’ favorite things about the house they lost — a full chimney composed of local stone. It was crafted by a local stonemason. 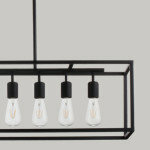 The mantel is a piece of reclaimed beam that matches those on the ceilings. This is the only room on the first floor with a TV, and it also has a record player for enjoying the album collection. The homeowners are often at the house with just the 11-year-old, but they also like to host a crowd, so Cooney kept a range of group sizes in mind. 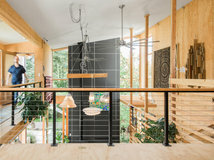 She designed the house with the idea that the guests and the owners would have spaces to gather in for socializing and to scatter to for quiet time. The barn door allows them to seal off the TV noise so that the other spaces can be kept quiet when needed. Conversely, this room also can serve as a quiet place for reading when there’s a lot of hubbub in the other rooms. Upstairs, the master bedroom is stacked atop the screened-in porch and enjoys views of the pond and property from large windows. The oak ceiling, velvet drapes and sitting area create coziness in the high-ceilinged space. This is another spot the homeowners can sneak off to when they have a full house and need some quiet time. 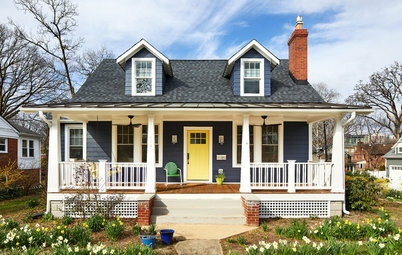 Lack of storage is a common problem in old homes that the rebuild remedied. The master suite hallway has scads of built-in closet storage, and the space to the left is a walk-in closet. 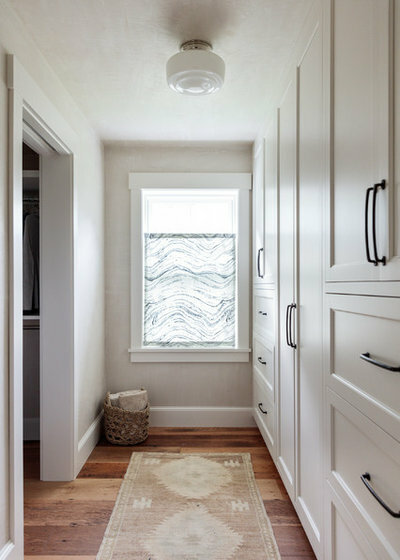 The marbleized fabric on the windows lets in the light while providing privacy for dressing, and it matches the Roman shades in the master bathroom. More Pietra Cardosa stone shows up in the form of the master bathroom sinks. 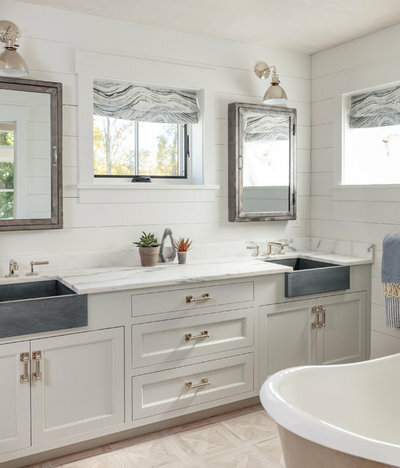 Shiplap walls bring in the relaxed country feeling, while zinc medicine cabinets have a vintage look. The bottom of the freestanding bathtub is also zinc. The tiled floors in all the bathrooms have radiant heat. There’s also a TV den and home office space upstairs. Built-in window seats offer a comfortable spot for reading and enjoying the views, as well as storage. The live-edge coffee table continues the use of wood. The walls are painted a deep blue-green. One of the homeowners has two daughters, 11 and 17, who are often at the house when she is there, while the other homeowner has four grown children who don’t stay here as often. Cooney planned for everyone. 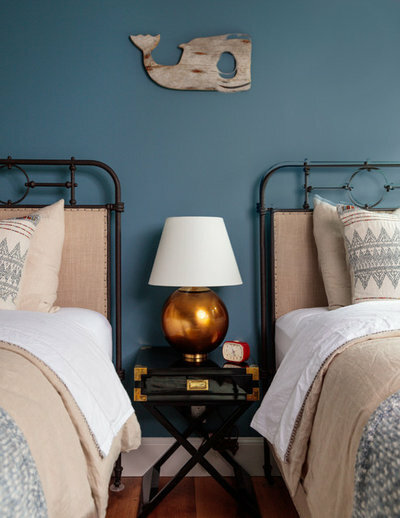 In this guest room, iron beds bring in an antique feel, while embroidered bedding and other textiles add layers of coziness. This is a favorite spot for the girls when they have a friend sleeping over, but it’s also sophisticated enough to welcome adults. This bathroom for two connects the previous bedroom to the 11-year-old daughter’s room. 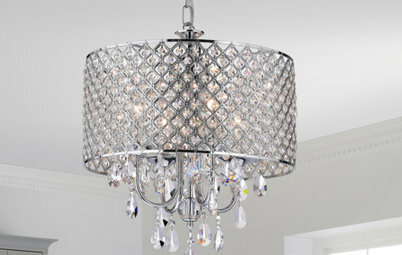 The bones of the room are classic, versatile and polished. But the wallpaper adds a playful and bright element that the girls love. “This would be really easy to change out if they need a different look in here because the rest of the room is so classic,” Cooney says. The kids also have a comfy playroom upstairs. There is room to read, play, draw and do crafts, and a TV is here too. The pullout boxes under the coffee table serve as seating and as storage for crafting supplies and reading materials. 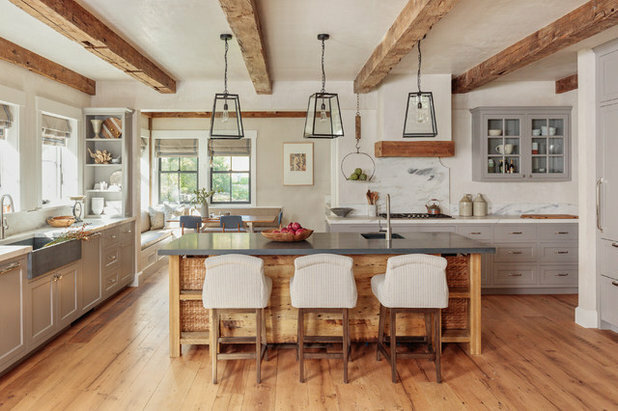 To add a sense of age to a house, choose materials like limestone, plaster and reclaimed wood. 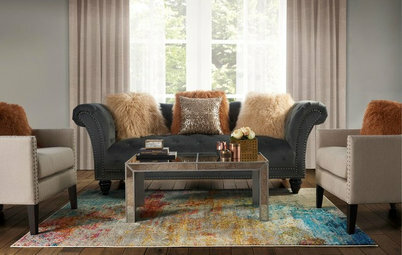 For a relaxed country feel, use a neutral palette with well-edited doses of color. 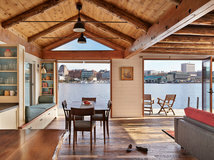 Consider using sliding barn doors to close off large openings and make spaces cozier. Plan a house with views in mind. The porch is where this family spends the most time, so it has the best views. Contain TV noise within a mostly open floor plan by including a room that can be closed off. 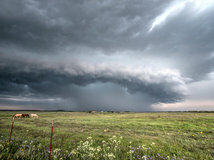 So well done, Jess Cooney.....love both this and the NJ home! IMO you executed the blending of old/new feel perfectly; the home is well decorated, without having every inch covered with “stuff”. (When homes are over-decorated you don’t know where to rest your eyes....not very relaxing for me.) A+ from me!